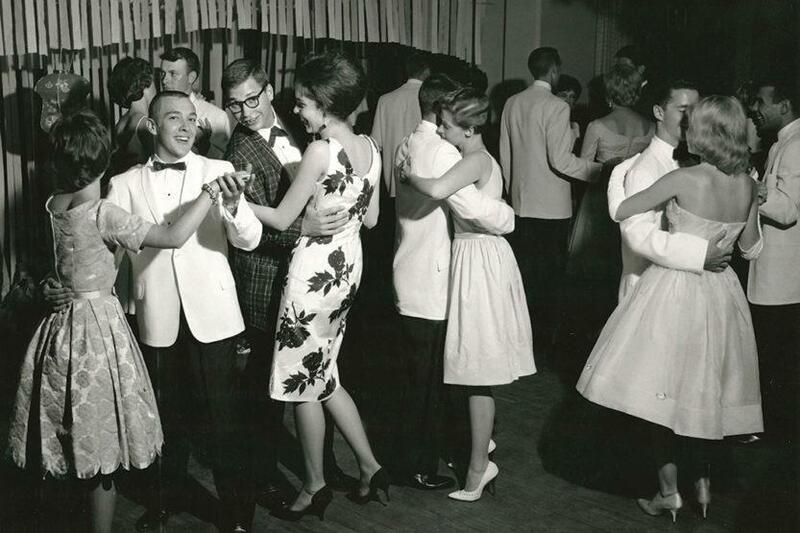 Right around the mid 20th century mark, the Buffalo Public School System decided to include, as part of its comprehensive Physical Education Program, a course in ballroom dancing. Even at this rudimentary level I found it terribly embarrassing trying to dance while hiding both the inner and outer manifestations that occur when an emerging 13-year-old boy makes his first physical contact with an emerging 13-year-old girl. To make matters worse, our instructor was a humorless, former ballroom dance champion, already hopelessly embittered by her longtime partner’s recent abandonment as well as her steep three month descent from National Championship competition at the Hollywood Palladium Ballroom in Los Angeles, (with Lester Lanin himself waving the baton) all the way down to teaching pimply faced teens the Box Step in a suburban Buffalo Junior High School. From my standpoint, however, the dilemma I faced eclipsed hers by a mile. While holding this real, live girl in my arms, the conflicting emotions collided inside my head like subatomic particles smashing together in a cyclotron. I was buffeted in all directions by the opposing crosswinds of blinding lust and revolting disgust. Although I never mentioned it to mom or dad, I was certain that by training me to become a 13-year-old gigolo, my endocrine system was being catapulted into chaos. Sure enough, at my next annual physical, our family doctor noted my abnormally high testosterone levels and expressed his bewilderment that I hadn’t yet sported a pencil mustache, purchased a cheap suit, started pomading my hair, and begun speaking with an Eastern European accent. As the years passed I sublimated the entire experience and became a musician, where I felt much more comfortable playing and watching the dancers from a safe distance. Swing dancing was pleasant enough to watch, but I was devoid of the passion necessary to get me out there to spank the planks with the other dyed-in-the-wool jitterbuggers. It wasn’t until my troth was plighted to one such passionate devotee that my dance lesson scars were torn open once again. It was made very clear to me from the beginning that it was either punish the parquet with Deborah, or die alone, so I surrendered myself to the inevitability of attending dance classes, which, in my mind conjured up the bleak picture of a room filled with inflexible, tired, misshapen, crabby adults, hostages really, attending under duress, as would I, each of us devoid of both the talent and the inclination to acquire a decent level of proficiency. After the wild horses that had dragged me to my first class were unyoked, I walked into the studio, my head bowed in defeat, prepared to face the music. There we stood, 16 nervous first-timers, spanning all age groups and walks of life, most of whom I imagined clung to the hope that by the end of the fourth week they would dance out of the room with the grace of Fred and Ginger, on the arm of a new mate, facing a brighter future, putting an end to their atrophied social life. After a few minutes, to my surprise, I began realizing that the other 15 initiates all seemed to be in high spirits, all enthusiastically anticipating the experience of traversing the room in each other’s arms. There was none of the desperation that I had assumed would saturate the proceedings. It became obvious that everyone wanted to be there. Promptly at 8:00 the “dance instructor” image I’d held onto for years vanished in a puff of powdered rosin, as our lovely young tutor floated into the room, smiling broadly, wearing an elegant body-hugging gown, hugging the very body that some of us might be hugging should any of us show enough progress to be chosen by her for the occasional demonstration. Suddenly confronted with the modern face of ballroom dancing, I began seeing things in the broader context of a career change. The thought of spending my days and nights surrounded by beautiful, graceful dancers, rather than unwashed musicians with yellow-collared tux shirts and oafish manners seemed infinitely more appealing. Perhaps a career in dance was in the cards for me after all, since I had just recently locked up an excellent dance partner for life, and, were I to begin at once, genuinely putting my shoulder to the wheel while keeping my eye on the prize, in ten or fifteen years I might just have a shot at winning Best In Show in the Senior Division. But I was getting ahead of myself. The first step would be to lay the foundation. The class began as we gingerly attempted a simple walking step, following which we were told to pair up. I was surprised at the great variance in the levels of physical proximity each of the women firmly established while in the clinch. The studio owner had instilled in his instructors his romantic philosophy, referring to a dance as a “three minute love affair,” and encouraged them to teach us to “get right in there,” not to be afraid of close contact. The ladies in the room represented a healthy cross section of distinct types, including the obese, the elderly, the man-eater, and the timid, each displaying their unique variations of “intimate” contact. One held me outward, straight-arming me to ensure that no part of my torso came within a foot of hers, while another pressed up against me, mashing me body-part for body-part, her face against mine, breathing warm air into my ear, with the others falling somewhere in between. Some partners made a sincere effort to live the “three minute love affair” scenario, while others maintained a strict watch on their feet, looking straight down while fighting me off. As the leader, I was told that it was my duty to subtly signal the woman, letting her know where and when I wanted her to move, but despite my best subtle attempts, one of the doms manhandled me terribly, pushing and pulling me around like a rag doll while coarsely lecturing me about being stronger and more confident in leading her. When the time came to rotate partners again she pushed me away with a sneer and a clicking of the tongue. (Hers, not mine) Fortunately, each complete round of partner-changes brought me back to my darling wife, with whom dancing was, and is, a dream, reenergizing me with the strength and courage to face the others for another go-round. Anyone might expect that after all my hard work and dedication, I might simply coast on my achievements, and that my decision to shun any further formal instruction might be interpreted as arrogance, but that would be an inaccurate portraiture of my character. On any given night, when Deborah and I go out to hear Vince Giordano’s Nighthawks, or attend Lincoln Center’s Midsummer Night Swing, I keep a watchful eye on the excellent dancers surrounding us, stealing every combination I can, and then adding it to my dance-step memory bank. I’m hoping that these clever moves will someday automatically incorporate themselves into my “three minute love affairs” on the right beat, at the right time, and now, free of rotating partners, with the right girl.